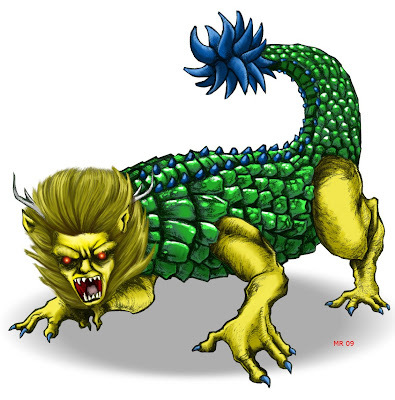 The Manticore is anther chimera, a creature which is made up of different body parts from different animals. Medieval bestiaries describe the creature as hailing from India, with the face of a man and a "musical voice." The creature could also posses one or more of the following: A scaled body like a crocodile, a mane like a lion, wings like a dragon, and the tail of a scorpion with which poison barbs can be flung like arrows. Modern research has poinpointed this laundry list of frightful imagry as a distorted description of the Indian Tiger. The root word from which "Manticore" is derieved means "Man eater."